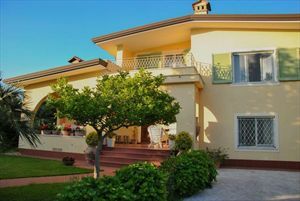 A modern detached villa (250 sq.m.) with a garden (550 sq.m. 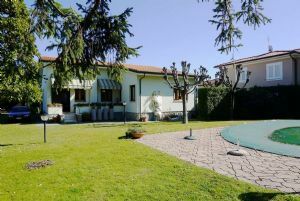 ), located in the center of Forte dei Marmi, about 500 meters from the sea. The villa is equipped with air conditioning, satellite TV, WI-FI, alarm system, automatic gate. 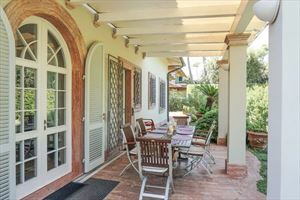 In the garden, there is a parking for several cars, laundry and 2 covered terraces with dining table and outdoor furniture. The basement comprises a living room, bedroom and a bathroom with shower. The ground floor has a living room, kitchen, dining room, double bedroom, bathroom with shower. Upstairs are 2 bedrooms with twin beds, bathroom with shower, master bedroom with king size bed and ensuite bathroom with tub and shower.